If you know Doctor Who then you recognize this piece. In an episode in Series 5 of the restart of the hit British show, the Doctor and Amy Pon visit Vincent Van Gogh after the Doctor sees a monstrous shape in one of Vincent’s paintings in an exhibit. Throughout the episode, we find that Vincent not only has mental issues but is gifted with, at times, visions of the future. He painted the above, a depiction of the TARDIS exploding and burning, a catastrophic event that haunts the Doctor’s future, though how or why he doesn’t know. 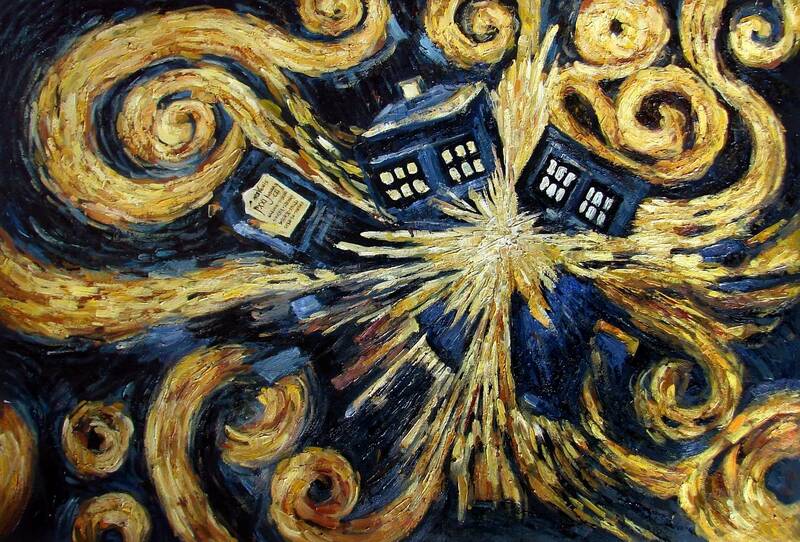 I think it’s beautiful and the fact that someone studied it and Van Gogh’s style enough to recreate it made me squee. Unfortunately, it was a single canvas and it was already sold. Ah, well. Next time, right?